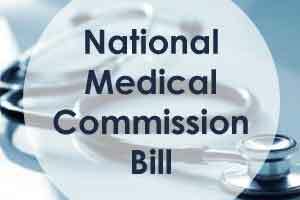 According to official sources, the government is keen to push important Bills including the National Medical Commission Bill, 2017 for consideration and passing in both the Houses of Parliament within the 18 working days of the session that will continue till August 10. The National Medical Commission Bill proposes to replace 83-year-old Medical Council of India (MCI) with another body called the National Medical Commission to curb corruption in the functioning of MCI. The opposition from the doctors, led to the formation of a Special parliamentary committee to take into consideration the concerns of doctors and suggest appropriate changes to the Bill. The committee earlier this year submitted its recommendations taking into account the various demands of doctors , many of which also soon met with the cabinet approval.